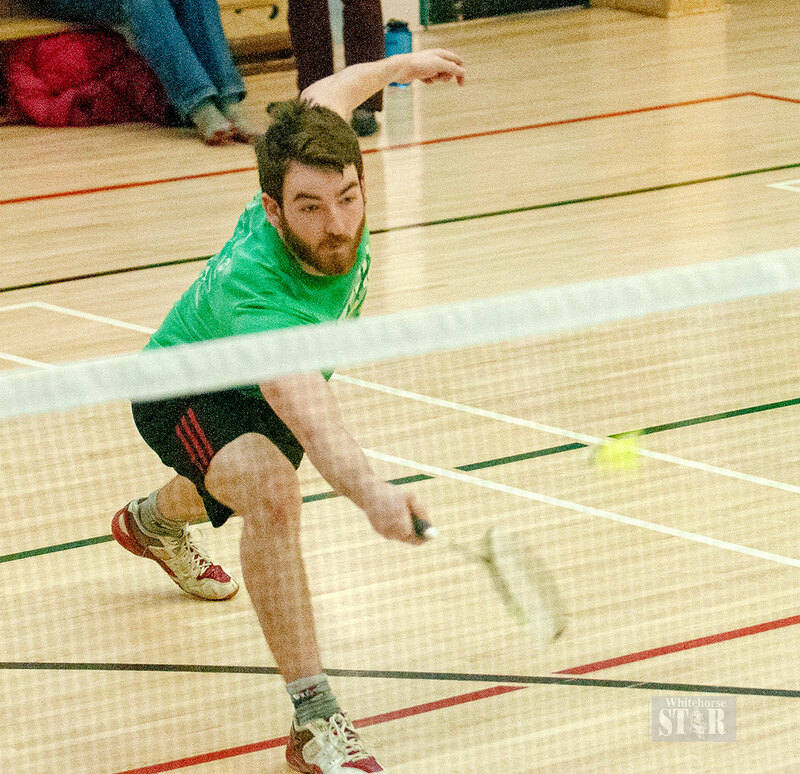 MAKING THE DROP SHOT — Angus Harden reaches for the birdie during the Yukon Badminton Association - 2019 Open Champions Men’s Doubles championship game at Takhini Elementary School on Saturday. The birdie went flying quickly through the air as the Yukon Badminton Association - 2019 Open Championships got underway at Takhini Elementary School on the weekend. The Championships featured players 19 and older and there were five different categories played. On Saturday, the Men’s Singles final was held between Angus Harden and John Kremer. The game was a battle between two talented badminton players as both players had their full arsenal of shots, smashes, drop shots, working. Matching the offence was the two competitors defence, as all in attendance were treated to long rallies as each player refused to let the birdie touch the court. Kremer was the first to 21 to win the first game of the match. The matches were best of three. In the second game, Harden was able to put the loss behind him. He dominated play, making Kremer move all over the court and forcing him into mistakes. Visibly frustrated, Kremer began talking to himself and Harden continued to roll as he was able to take the second game to set up a third and deciding game. Kremer dictated the play early in the final game jumping out the lead. He was the first player to make it to 11 points. The two players switched sides of the court after. Harden found his form after the switch and the game remained within one point or tied as the two approached 21. Harden forced Kremer deep and Kremer’s return fell narrowly out of bounds. With the match on the line, the two got into another rally. The match ended when Kremer sent the birdie into the net. Having recently moved to Whitehorse from Calgary, Harden said he was surprised by the level of play. Harden said Kremer gave him everything he could handle. The win, Harden said, was really rewarding, especially coming from Calgary. “Coming from Calgary there is a huge scene there and obviously Whitehorse has a smaller population,” said Harden. “It’s been a really rewarding experience to be one of the finishers in a tournament, I’ve never had that experience before. Harden said even though Whitehorse has a smaller population than his hometown the top end talent is still comparable. The Women’s Singles was won by Caroline Thibault who defeated Anastasiya Matlashevska. Erin Johnston teamed up with Matlashevska in the Women’s Doubles. The duo defeated Thibault and Nicole Jacques for the title. Harden and Kremer teamed up to win the Men’s Doubles defeating Wayne Coghill and Jonathan Gauthier. Kremer and Thibault were the last team standing in the Mixed Doubles after beating Coghill and Johnston. The Junior Championships are next and will be held at Porter Creek Secondary on May 3. In order to encourage thoughtful and responsible discussion, website comments will not be visible until a moderator approves them. Please add comments judiciously and refrain from maligning any individual or institution. Read about our user comment and privacy policies. Your name and email address are required before your comment is posted. Otherwise, your comment will not be posted.